Priya is a Bharatnatyam dancer, teacher with interest in dance research. 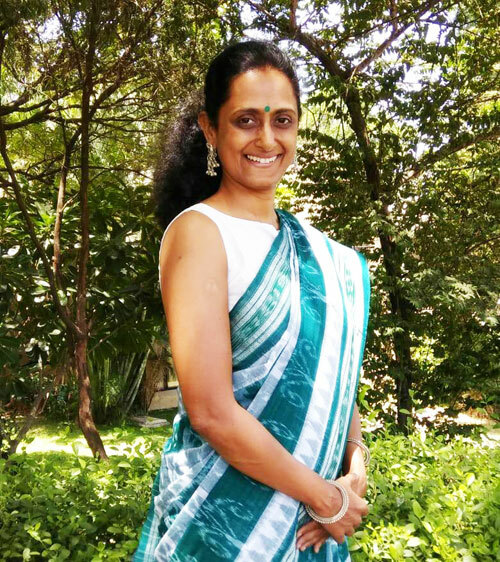 Priya is a founder director of ‘Kalanilayam Center for Dance’ which is engaged in spreading the essence of Bharatnatyam since past 15 years at Sinhagad road, Pune under the umbrella of Kalavardhini Charitable Trust. Priya is on the Panel of Gurus’ at the ‘Lalit Kala Kendra’, Pune University and the ‘School of Performing Arts’, Bharati Vidyapeeth Deemed University. She is also a member of ‘International Association for Dance Medicine and Science’ (IADMS) and a committee member of ‘International Association for South Asian Dance Medicine and Science’. One day one of my talented students, who had completed her arangetram, came to me and said,” I had to get an MRI done for the knee and now Doctor has asked me not to dance forever”. I felt bad after hearing this but accepted it as I was left with no option. Then I met a friend who was a Bhartanatyam dancer and was suffering from back pain. She had to change her dance style due to the severe pain. Later one of my students had to undergo an ‘arthroscopy’. Recently I realized that few students were not able to dance optimally due to ‘hormonal imbalance’. The thought of such talented and sincere students and dancers not able to pursue their passion for such a beautiful art form because of health problems, made me restless. During the same time, I came across a website of ‘International Association for Dance Medicine and Science’ (IADMS).Their tagline ‘Dedicated to improving dancers’ health’ captured my attention. I attended their annual conference in 2012 at Singapore. Surgeons, physiotherapists, dancers, dance teachers, sports medicine professionals and professors from various universities were gathered with the sole purpose i.e. ‘Dancers and their health’. Many elements related to dance were discussed during different sessions. Dance is a complex art form. To become a dynamic performer, a dancer needs to accomplish many skills. While doing so, is he/she taking enough care of her physical health, is he/she taking necessary precautions to avoid injuries, in case of injuries how is the rehabilitation done in order to be able to return to dance with full potential, whether it would affect his/her capacity as a professional dancer, were topics of discussion at the conference. It was realized through some of the case studies that all the above mentioned professionals when worked in close coordination with each other helped the dancer to get back to his/her routine successfully. I learnt a lot from this conference and most importantly, became aware about the health issues of dancers. I had the opportunity to participate in the 26th conference of IADMS recently organized at Hong Kong through FLAME University. There was a good representation of young students along with the experts from the field of Dance Medicine, Science and Dance education. 'Health issues faced by Indian dancers and its impact on pursuance of dance' was my topic of presentation. This research was co-authored by Dr. Poonam Gandhi, my colleague at FLAME University. The research was based on health issues faced by Kathak and Bharatnatyam students and dance professionals at Pune. There has been bounteous research on dance styles like Ballet, Jazz, and Contemporary dance so far. Therefore, there was a curiosity among the members present regarding this presentation based on Indian Dance. 1. It is extremely important to do ‘warm up’ before one begins the dance practice or riyaz and to do ‘cool down’ after the practice is over. 2. It is necessary to understand the concept of ‘holistic exercise’ and ‘supplementary training’ for dance in order to receive optimal results. 3. Controlled, consistent and wholesome diet should be a discipline imbibed by every dancer. 4. Dancing on hard surface or surface which could cause negative impact on the body should be avoided. 5. An appropriate posture to be maintained while carrying out day to day activities like driving, walking, sitting, standing etc. 6. Taking enough rest is essential. 7. It is important not just to learn a dance movement aesthetically or technically, but also to understand it anatomically. 8. Pre-pregnancy and post pregnancy dance routines should be well thought of and planned. 9. In case of any injury, immediately consulting a doctor is important. Please do not ignore the pain. Continue dancing just by relying on household remedies would be harmful in long run. 10. Due to the high growth spurt during adolescence, the teaching techniques should be modified as per the needs of the adolescent students. 11. For a better dance, it is necessary to avoid unnecessary stress/tension on dancer’s body. 12. In case of hormonal problems like thyroid, PCOD etc., the dance teacher should be informed and dance should be pursued under proper medical supervision. 13. Everyday 15 minutes exposure of the entire body to the direct sunlight is good for strong bones and muscles. 14. A complete medical checkup and necessary pathology tests once every year is highly recommended. Early diagnosis of any problem, if any, can be rectified on time. The dance scenario at Pune is expanding every passing day. Young generations are enthusiastically coming forward to pursue dance as a full time career option, with the strong support from family and society. Changing lifestyle makes it difficult to seek physical and mental well being, in a tight schedule of study, riyaz and program. There seems no option but to have a healthy body to be able to create a flawless performance. This awareness can be seen to some extent in professional dancers but it needs to penetrate effectively to the student community as well. Ultimately, it is necessary to understand that dance and healthy body are 2 sides of the same coin! This article has been earlier published in Maharshtra Times,Pune .